Moscow, September 18, Interfax - Symbolic action Flower road between Japan and Russia took place in Sts Martha and Mary Convent of Mercy in Moscow. Japanese prefecture Shimane presented the convent unique treelike emperor peonies as a sign of friendship between peoples of Japan and Russia, the Moscow Patriarchate reports on its website. The Japanese believe that masters of the houses decorated with flowerbeds and gardens enjoy divine help. The treelike peony is especially venerated in Japan, it is called a flower of emperors and the emperor among flowers. Peonies are brought to Russia not for the first time. Emperor flowers were planted in Vladivostok, Khabarovsk, and St. Petersburg for several years in frames of the action. On the day of Japanese delegation’s visit, the Liturgy was celebrated by Archbishop Feognost of Sergiyev Posad, Chairman of the Synodal Department for Monasteries and Monks. 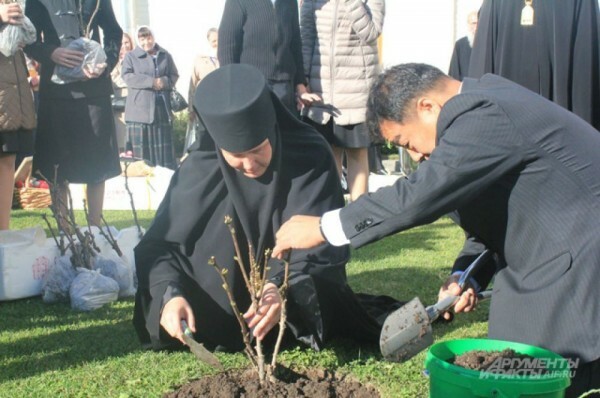 After the Liturgy, the archbishop, the rector of the convent Hegumenia Yelizaveta (Pozdnyakova) and members of the Japanese delegation planted peonies to a flowerbed in the convent garden. “There’s a legend that flowers and singing are remains of paradise on earth and in paradise people were careless and didn’t seek profits and benefits. Flowers and singing make the use of useless things. You came with mission of peace and love. The Savior teaches us peace: “I give you my peace,” “Peace unto you,” the archbishop told the guests.